The current set of IHG Pointbreaks hotels or what’s left of the list come to a close in a few days and as is customary, IHG is providing a preview of the next set of hotels. What came as a surprise with the sneak a peek release yesterday are changes to the Pointsbreak system. 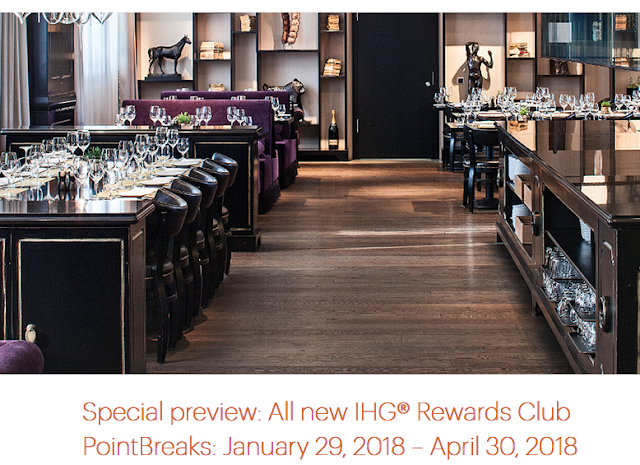 Up until now Pointsbreaks hotels have always been 5,000 points per night regardless of the hotel and typically had between 100 and 150 hotels but over the years the better high end hotels like InterContinental hotels became rare on the list as 5,000 was a steal to stay at them. Hence the reasoning that Pointbreaks was the best hotel redemption offer in the market. That all changes with the new list that will go live on Monday. No longer will all hotels be 5,000 points, some will still be at that level but there will now be hotels at 10,000 and 15,000 points. IHG states they are making the changes so they can add more hotels to the list and include more higher end hotels. If the sneak a peek was any indication then this is true. The next set of hotels comprises of over 200 hotels and includes at least three InterContinental properties which is a lot more than most of the past Pointbreaks lists. Only one hotel in Canada in the preview - typically we've seen 5 to 6 hotels on the list in our home country so hopefully the larger list means more locations close to home. The one in the preview is the Holiday Inn Express & Suites Calgary at the 15,000 point level - this seems steep to me but that's 50% off the regular requirement of 30,000 points at this location. I don't believe this particular location has been on the list before so there is definitely some give and pull here. We've read a lot of back and forth on whether the amounts ranging from 5,000 to 15,000 points is a good thing or a bad thing. Of course the good is that there are more hotels on the list and hopefully more higher end hotels but the bad is they are not all 5,000 points. Here’s the thing though, more hotel options at the higher end at 15,000 points still works out to under $100 per night if and when you can buy IHG Rewards Club points with a 100% bonus although right now the bonus is 75%. Those high end hotels will range from $200 to $500+ per night which means you are still getting a great deal just not as great as before. The new Pointbreaks system will also allow members to use Points+Cash for the reduced stays. Not sure if the pricing will be like a regular night redemption but it should be close to something like redeem 5,000 points + $80 or 10,000 points + $50 for a hotel that costs 15,000 points. Here is a peek at 30 of the 200+ hotels that will be available for booking on Monday around 12pm ET. (Source IHG Blog). Be sure to check out this page for the full list come that time!